Nail Newbie: 33 Day Challenge day 33!!! Freestylin'! Well, I made it! 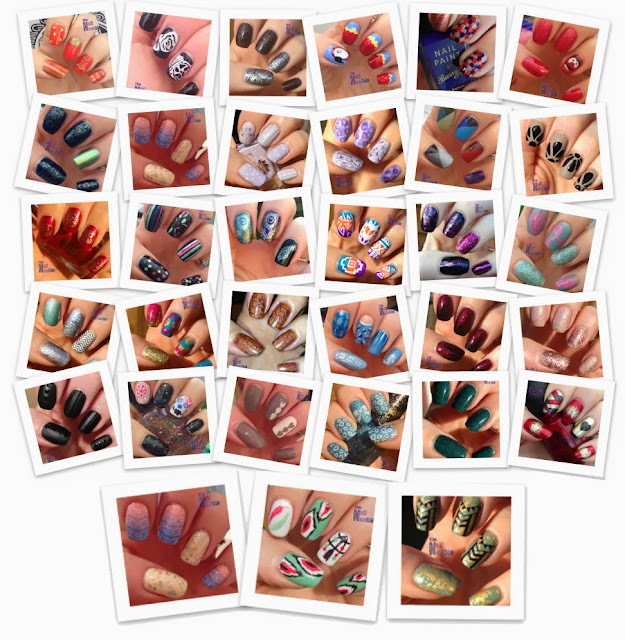 I am chuffed I completed the challenge on time, posted every day and even got a few good manicures in there! Go me! Our final challenge was either a recreation of someone else's mani , or to go freestyle so I combined a bit of both with some #33DC skittles. I started with a base of China Glaze Electric Beat on all my nails (leaving a half moon on the middle finger). A simple glitter gradient on my pinkie, with Barry M Silver Glitter and Dollish Polish I Triple Dog Dare Ya! and a thin coat of OPI Silver Shatter on my thumb framed my recreations on the ring, middle and index fingers. The ring finger sports a Nailasaurus waterfall, as seen in the challenge by Brandy's Nailtastic Blog, Fingerfood, and Glam-madam. The polishes used were China Glaze First Mate, and Blue Years Eve, Models Own Feeling Blue and Rimmel Your Majesty. The middle finger was inspired by Sarah at Penny Pinching Polish - a half moon with added leopard print, because why the hell not. This one used Blue Years Eve and Your Majesty. And my index finger was another Nailasaurus design, as seen by Nailaddict, Ros and Brandy again (and I loved my original version so much, I wanted to do it again!) I used the same colours as I did for the waterfall, and I think the addition of a couple of shimmery polishes really adds depth. So, that's it! Which of my 33 manis has been your favourite? My top 3 were the 3 colour gradient and pattern, Indian and new technique, with my South American Macaw coming in a close forth.